Vertical shaft of glass blocks at stairs. 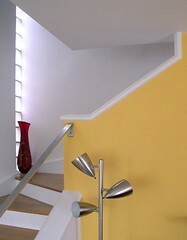 View of staircase with bent aluminum handrail and vertical shaft of natural light. The Deffaa Residence was designed by Harris Armstrong in 1937. The floor structure at the upper level is cantilevered at the inside corner of the stair.